With all the protests over the past several years, it has become known that if the signs are misspelled, it’s a right-wing protest. If you ever wondered if the same holds true for those signs you see written in Arabic in the protests in Egypt, Tunisia, Syria, etc., no, it doesn’t. Arabic, like many languages more sensible than English, is spelled how it sounds and sounds how it’s spelled. They don’t have spelling tests and spelling units and spelling bees. There are some regional variations in pronunciation, admittedly, but it’s nothing like the orthographic free-for-all we have in English. So, as my picture above indicates, you can’t reliably guess an Arab protester’s alignment by the spelling. The Library of Congress posted this article about Islam in the early United States. …or isn’t this woman a dead ringer for Emilio Estevez? 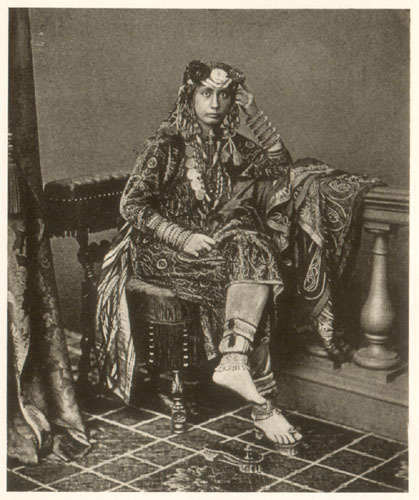 Emily Ruete (1844-1924) was born in Zanzibar as Sayyida Salme, Princess of Zanzibar and Oman. Almost. Sayyida is not her name, it’s an indication that she’s supposedly a descendant of the prophet Muhammad, and I don’t know that “princess” is the most appropriate designation, but she wrote her own history for a western, Christian audience, so “princess” is what they would have understood. But seriously, she looks like Emilio Estevez, right? The geocentric model held sway into the early modern age; from the late 16th century onward it was gradually replaced by the heliocentric model of Copernicus, Galileo and Kepler. Muhammad ibn Jābir al-Harrānī al-Battānī (Albatenius) (853-929) discovered that the direction of the Sun’s eccentric was changing, which in modern astronomy is equivalent to the Earth moving in an elliptical orbit around the Sun. In the late ninth century, Ja’far ibn Muhammad Abu Ma’shar al-Balkhi (Albumasar) developed a planetary model which some have interpreted as a heliocentric model. This is due to his orbital revolutions of the planets being given as heliocentric revolutions rather than geocentric revolutions, and the only known planetary theory in which this occurs is in the heliocentric theory. His work on planetary theory has not survived, but his astronomical data was later recorded by al-Hashimi, Abū Rayhān al-Bīrūnī and al-Sijzi. Mo’ayyeduddin Urdi (d. 1266) was the first of the Maragheh astronomers to develop a non-Ptolemaic model, and he proposed a new theorem, the “Urdi lemma”. Nasīr al-Dīn al-Tūsī (1201-1274) resolved significant problems in the Ptolemaic system by developing the Tusi-couple as an alternative to the physically problematic equant introduced by Ptolemy, and conceived a plausible model for elliptical orbits. Tusi’s student Qutb al-Din al-Shirazi (1236-1311), in his The Limit of Accomplishment concerning Knowledge of the Heavens, discussed the possibility of heliocentrism. ‘Umar al-Katibi al-Qazwini (d. 1277), who also worked at the Maragheh observatory, in his Hikmat al-‘Ain, wrote an argument for a heliocentric model, though he later abandoned the idea. For example, it was Ibn al-Shatir’s concern for observational accuracy which led him to eliminate the epicycle in the Ptolemaic solar model and all the eccentrics, epicycles and equant in the Ptolemaic lunar model. His model was thus in better agreement with empirical observations than any previous model, and was also the first that permitted empirical testing. His work thus marked a turning point in astronomy, which may be considered a “Scientific Revolution before the Renaissance”. His rectified model was later adapted into a heliocentric model by Copernicus, which was mathematically achieved by reversing the direction of the last vector connecting the Earth to the Sun. In the published version of his masterwork, De revolutionibus orbium coelestium, Copernicus also cites the theories of al-Battani, Arzachel and Averroes as influences, while the works of Ibn al-Haytham and al-Biruni were also known in Europe at the time. During this period, Islamic-ruled regions of Europe, such as Al-Andalus, the Emirate of Sicily, and southern Italy, were slowly being reconquered by Christians. This led to the Arabic-Latin translation movement, which saw the assimilation of knowledge from the Islamic world by Western European science, including astronomy. In addition, Byzantine astronomers also translated Arabic texts on astronomy into Medieval Greek during this time. In particular, Gregory Choniades translated several Zij treatises, including the Zij-i Ilkhani of the Maragheh observatory, and may have played a role in the transmission of their work (such as the Tusi-couple) to Europe, where it eventually influenced Copernican heliocentrism. In the late 20th and early 21st centuries, there have also been a number of Muslim astronauts, the first being Sultan bin Salman bin Abdulaziz Al Saud as a Payload Specialist aboard STS-51-G Space Shuttle Discovery, followed by Muhammed Faris aboard Soyuz TM-2 and Soyuz TM-3 to Mir space station; Abdul Ahad Mohmand aboard Soyuz TM-5 to Mir; Talgat Musabayev (one of the top 25 astronauts by time in space) as a flight engineer aboard Soyuz TM-19 to Mir, commander of Soyuz TM-27 to Mir, and commander of Soyuz TM-32 and Soyuz TM-31 to International Space Station (ISS); and Anousheh Ansari, the first woman to travel to ISS and the fourth space tourist. In 2007, Sheikh Muszaphar Shukor from Malaysia traveled to ISS with his Expedition 16 crew aboard Soyuz TMA-11 as part of the Angkasawan program during Ramadan, for which the National Fatwa Council wrote Guidelines for Performing Islamic Rites (Ibadah) at the International Space Station, giving advice on issues such as prayer in a low-gravity environment, the location of Mecca from ISS, determination of prayer times, and issues surrounding fasting. Shukor also celebrated Eid ul-Fitr aboard ISS. He was both an astronaut and an orthopedic surgeon, and is most notable for being the first to perform biomedical research in space, mainly related to the characteristics and growth of liver cancer and leukemia cells and the crystallization of various proteins and microbes in space. Other prominent Muslim scientists involved in research on the space sciences and space exploration include Essam Heggy who is working in the NASA Mars Exploration Program in the Lunar and Planetary Institute in Houston, as well as Ahmed Salem, Alaa Ibrahim, Mohamed Sultan, and Ahmed Noor. The first mechanical astrolabes with gears were invented in the Muslim world, and were perfected by Ibn Samh (c. 1020). One such device with eight gear-wheels was also constructed by Abū Rayhān al-Bīrūnī in 996. These can be considered as an ancestor of the mechanical clocks developed by later Muslim engineers. The first navigational astrolabe was invented in the Islamic world during the Middle Ages, and employed the use of a polar projection system. Abu Rayhan al-Biruni invented and wrote the earliest treatise on the orthographical astrolabe in the 1000s. The first astrolabe instruments were used to read the rise of the time of rise of the Sun and fixed stars. The first universal astrolabes were later constructed in the Islamic world and which, unlike their predecessors, did not depend on the latitude of the observer and could be used anywhere on the Earth. The basic idea for a latitude-independent astrolabe was conceived in the 9th century by Habash al-Hasib al-Marwazi in Baghdad and the topic was later discussed in the early 11th century by Al-Sijzi in Persia. The Zuraqi is a unique astrolabe invented by Al-Sijzi for a heliocentric planetary model in which the Earth is moving rather than the sky. In the early 11th century, Abū Rayhān al-Bīrūnī invented and wrote the first treatise on the planisphere, which was an early analog computer. The astrolabe was a predecessor of the modern planisphere. A famous work by Sharaf al-Dīn al-Tūsī is one in which he describes the linear astrolabe, sometimes called the “staff of al-Tusi”, which he invented. Ibn al-Shatir invented the astrolabic clock in 14th century Syria. Various analog computer devices were invented to compute the latitudes of the Sun, Moon, and planets, the ecliptic of the Sun, the time of day at which planetary conjunctions will occur, and for performing linear interpolation. The Equatorium was an analog computer invented by Abū Ishāq Ibrāhīm al-Zarqālī (Arzachel) in al-Andalus, probably around 1015 CE. It is a mechanical device for finding the longitudes and positions of the Moon, Sun, and planets, without calculation using a geometrical model to represent the celestial body’s mean and anomalistic position. Abu Rayhan Biruni also invented the first mechanical lunisolar calendar computer which employed a gear train and eight gear-wheels. This was an early example of a fixed-wired knowledge processing machine. The volvelle, also called a wheel chart, is a type of slide chart, paper constructions with rotating parts. It is considered an early example of a paper analog computer. The volvelle can be traced back to “certain Arabic treateses on humoral medicine” and to Biruni (c. 1000) who made important contributions to the development of the volvelle. In the 20th century, the volvelle had many diverse uses. Jabir ibn Aflah (Geber) (c. 1100-1150) invented the torquetum, an observational instrument and mechanical analog computer device used to transform between spherical coordinate systems. It was designed to take and convert measurements made in three sets of coordinates: horizon, equatorial, and ecliptic. In 1206, Al-Jazari invented his largest astronomical clock, the “castle clock”, which is considered to be the first programmable analog computer. It displayed the zodiac and the solar and lunar orbits. Another innovative feature of the clock was a pointer which traveled across the top of a gateway and caused automatic doors to open every hour. In 1235, Abi Bakr of Isfahan invented a brass astrolabe with a geared calendar movement based on the design of Abū Rayhān al-Bīrūnī’s mechanical calendar computer. Abi Bakr’s geared astrolabe uses a set of gear-wheels and is the oldest surviving complete mechanical geared machine in existence. In the 15th century, al-Kashi invented the Plate of Conjunctions, a computing instrument used to determine the time of day at which planetary conjunctions will occur, and for performing linear interpolation. And there’s a lot more, but my copy-and-paste fingers are getting tired. Astronomy in Medieval Islam Wikipedia page. This came up because I just looked at an article about the Vatican’s dusting off some old astronomical equipment they’ve kept sequestered away for years, including something I had never heard of before, an orrery. There I was, reading about this Sri Lankan-American teenaged cheerleader who ran away from her parents to live with a pastor and his wife, then claimed that her parents threatened to kill her for converting to Christianity. The parents say that’s ridiculous, the police consider the parents credible, and the coverage is relatively even-handed. …they are hardly the kind of fundamentalist Muslims who would declare a medieval fatwa, or death sentence, on their daughter. A fatwa, medieval or not, is not a death sentence!!! It’s a legal opinion based on Islamic law. And how would someone in 2009 declare a medieval fatwa? Time travel? I trust that the authorities in pastor Lorenz’s city are investigating him for using Facebook to lure a teenaged girl across the country into his clutches. UPDATE: realisticbird asked in the comments: What would their reaction be if the case war reversed and the Christian girl went to the Muslim family? 13:9 But thou shalt surely kill him; thine hand shall be first upon him to put him to death, and afterwards the hand of all the people. 17:5 Then shalt thou bring forth that man or that woman, which have committed that wicked thing, unto thy gates, even that man or that woman, and shalt stone them with stones, till they die. For more than a week I’ve wanted to post about CNN’s Generation Islam feature, and it has been thwarting me by making it impossible to copy and paste the text or save the graphics. I had to resort to typing. It is not clear to me why CNN is interested in disseminating a mix of accurate and inaccurate information about Islam right now, but they’re doing it and so here I am. The Generation Islam premise seems to be that Muslims are exotic people in strange clothes who live far away and that there is a giant gulf between us and them, and that those Muslims resent us for mysterious reasons and we might want to do something about it so they don’t hurt us again. 9/11 taught the U.S. that it ignores rising Muslim resentment at its own peril. America can’t have another generation of Muslims who hate it. Is it possible to win the hearts and minds of Muslim youth? This will take more than one blog post to squeeze all the possibilities out of Generation Islam. Let’s start with the simple stuff and go to the Islam: Key facts page. Islam has a monotheistic (belief in one God) message and follows some of the same principles as Christianity and Judaism. Muslims, the followers of Islam, believe in Allah and believe Mohammed was his prophet. I used to expect better from CNN. Of course, that was before Lou Dobbs starting telling lies in prime time and getting away with it. So now I’m dying to know which principles CNN thinks Muslims follow that Christians and Jews also follow, and which ones CNN thinks they don’t. CNN also leads us to think that Muslims believe in some crazy, alternative god named “Allah,” whose pronoun doesn’t get capitalized the way good old American God’s pronoun does. CNN has several related articles on the page. Kind of a journalistic version of “scent layering,”* which a guy in my college speech class explained as he gave us all an Amway-style sales pitch as a class assignment. I saw part of the story about the Muppet Show for Palestinian children the other day. Maybe I’ve gotten overly sensitive, but the vibe I got from what I saw was that Palestinian children are inherently prone to violence, probably due to their Arab genes, and need extra handling and guidance to guide them on the right path. An internationally respected Palestinian journalist, Kuttab began working with the show more than a decade ago. After covering the war-torn region for years, he realized that Sesame was a great way to reach Palestinian children who desperately needed an alternative to the harsh lessons they were absorbing. “I would say 3-, 4-, 5-year olds — if we don’t catch them at that early age, we do risk losing them to all kinds of propaganda, whether it’s conservative, religious or fundamentalist,” Kuttab said. Okay, I would argue that Palestinian children aren’t absorbing any worse lessons than Israeli children are. Different, sure. Palestinian children are seeing that they are second-tier human beings, and they can expect to spend their whole lives being pushed around, made to wait in interminable lines, walled off from their own property, arrested or shot for venturing outdoors, etc., but Israeli children are learning that apartheid is natural, that some people are far beneath others, and that disproportionate violence is the only way to deal with your unfounded fears. “We are interested in teaching tolerance, respect, pride in their own country and their own nation, and also in understanding that there are people who are different, and that’s OK,” Kuttab said. Sesame Workshop hopes to expand this type of localized programming into other areas that have witnessed recent conflict, such as Pakistan. Perhaps that means Iraq will get its own show someday and won’t have to hold on to someone else’s. The bolding is mine. As far as I can see so far, this is the only acknowledgement in this entire Generation Islam cloud of “information” that the population of Gaza is in distress, and that those scary Muslims who might wish to do violence to us might have a reason for it. More information here would have done a world of good, CNN. As for Shara’a Simsim, it’s basically nothing more than a new market for Sesame Street. At least it’s not Disney Princesses. *Off-topic plea: please go easy on the perfume and cologne. As in, I shouldn’t be able to smell your perfume or cologne unless I am snuggling you.